The History of Quail Run Farm. In September 1976, Peter, our sons Richard 9, Matthew 7 and Andrew (Dew) 18 months and our Labrador Sammy arrived at DFW from London to start our new lives in Texas. Peter an anesthesiologist had been recruited by Baylor University Medical Center in Dallas. We lived in Northwood Hills, Dallas. The following year, Jan bought a lovely palomino mare for the boys and she to share which we kept at Willow Bend Polo and Hunt Club. We realized that with rapid housing development that we needed to find a place in the country. The first time I drove the family along the overgrown drive, the tree branches scraped across my station wagon. Birds scurried ahead of us. One of our son’s exclaimed, “Look dove are running up the drive!” Matthew replied, “They are quail, Quail Run! I told the boys that if we bought the farm we would call it Quail Run Farm! Peter and I purchased QRF in May 1983. The farm had not been maintained for many years. There were no acceptable fences to be seen. We later discovered barbed wire hidden in the thatched coastal Bermuda grass. Many area were overgrown with mesquite, in fact we did not discover the second barn or distant fields until we had visited the property several times! As I walked over the land I could see the potential for a cross country course! We hired a bulldozer for ten days and Peter, Richard 15 and Matthew 13 and I shared turns with our ranch hand to pull out Mesquite and bois d’arc trees with huge long roots. Gradually we removed old barbed wire fences and cleaned up the fields. We mowed an area around the original old 1860’s farm house and installed an electric fence so that we could safely bring our three horses out to the farm for the week ends while we continued to work the land. By October we had made our first hay crop and had purchased 30 Angus and 30 Hereford heifers to clean up the farm. We had installed miles of electric fences to contain our herd. The winter of 1983/84 was to be the worst winter on record. For six weeks the temperature did not rise above freezing and for two of those it did not rise above 20F. Our main water line froze and the 3 acre lake had 6” of ice on it. Daily I filled garbage cans with hot water from our washing machine outlet in N Dallas and drove our 1 ton p u truck to the farm to water the cows, our pony Smokey and QH “JD”! As soon as I broke the ice in the lake it would re freeze! The following summer the Herefords heifers continued to develop “pink eye” so we sold them. The following year we bred our remaining Angus heifers to a Brangus bull and started our Angus Brangus herd of cows. In 1987 at a NTEA Board meeting I asked if they would be interested in helping to organize and build a Horse Trials at QR. A few months later the NTEA newsletter said that we were having a HT in October! 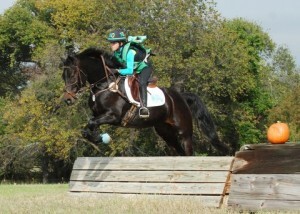 I was flabbergasted as we only had two XC fences at the time! By show date we had built a Novice course, Beginner Novice and “Even I Can Do it” course! I found course building material consisting of, electric company spools, power poles, logs, rubber tires and had dug a ditch, and with the aid of a few NTEA members we finished our courses! The following year we hosted our first USCTA (now USEA) recognized event! We continued to host recognized events until 2002. 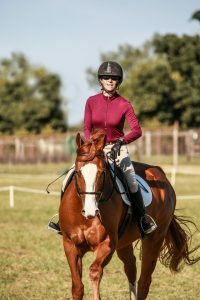 By which time Area V had gone from five recognized events to 30 dates on the eventing Calendar. 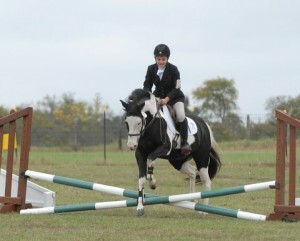 I retired with relief, but started doing Schooling events which were far less stressful and more enjoyable to organize!